The history of Dalhousie is synonymous with that of its owners, the Ramsay family, who have held Dalhousie longer than any other family has retained possession of a castle in Scotland. Accounts vary, but the Ramsay family probably came to Scotland in the 12th century. All that remains of the earliest castle are the walls at the foundation level and the vaulted dungeons. Edward I of England spent a night at Dalhousie before marching on to defeat the Scots patriot William Wallace at Falkirk, and William Ramsay later joined Robert Bruce’s forces at the Battle of Bannockburn in 1314. When the English gained the upper hand in the war against Scotland, many castles, including Dalhousie, passed into their hands. For years Sir Alexander Ramsay, Williams son, led forays against the castle, until the English finally surrendered and returned it to the family. A charter of 1618 granted the Ramsay family royal recognition with the title of Lord Ramsay of Dalhousie, and the family became favorites of King James VI of Scotland. They later pledged allegiance to the Parliamentarians during the English Civil War and hosted Oliver Cromwell. Members of the family served in the Wars of the Spanish Succession and one was a signatory to the capitulation of Quebec to General Wolfe. The 9th earl and governor-in-chief to North America founded Dalhousie University in Halifax and was present at the Battle of Waterloo. One of his lifelong friends was Sir Walter Scott. His youngest son, James, became a famous governor-general of India. Since the early 20th century, the earls of Dalhousie have lived in another home at Brechin. 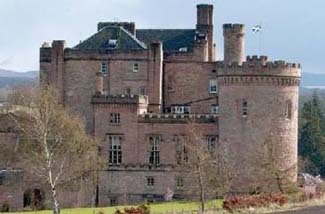 The building we see today at Dalhousie was built in 1450 of red stone quarried from the nearby South Esk River. Splurge on one of the themed rooms inside the castle for the atmosphere. Also, make sure you ask for a room that doesn’t face the gravel parking lot. Bonnyrigg is just outside of Edinburgh. Take A7 south through Lasswade and Newtongrange. Turn right on B704. The castle is 1/2 mile farther on the left. However, to reach it, turn right and go back under the road bridge. Yes. Private chapel available. Inquire hotel for details. If you were a castle guest here in medieval times, you would have crossed a drawbridge over a deep moat to reach the front door. If you had no invitation in hand, the residents might have poured burning oil on you from an opening in an overhead parapet or lowered you by ropes into a ten-foot-square windowless dungeon. All features that can be seen today. Hospitality to the wayfarer at Dalhousie has changed considerably. Completely restored, the castle is an elegant and charming hotel. An Imperial staircase, built around 1840 to resemble a ships quarter-deck, leads upstairs from the entrance hall. A magnificent oak-paneled library with a molded ceiling makes a fine place to relax with a book in front of a blazing fire. Guests gather here for a pre-dinner drink from the “secret bar” hidden behind a false bookcase door, and to gaze out the window at the river Esk. Several guest rooms carry historical themes. In the castle tower, the Dalhousie Suite features a 16th-century-style reproduction four-poster bed and oak furniture, a private corridor decorated with miniature tapestries leads to an antique-decorated bathroom. The Sir William Wallace Suite blends the castles natural stone with Gothic-style fittings; oak paneling and tiles with the Wallace crest line its bathroom. The India Suite, named in honor of the young Dalhousie who became a governor-general of India, has a canopy bed and furniture copied from the period of the Raj. “Ordinary” rooms feature twelve-foot-high ceilings and tall windows framed with heavy brocade drapes. The ancient barrel-vaulted dungeon serves as an unusual (and highly regarded) restaurant with candlelight dining. Local game and fish feature prominently on the menu.